I blog a lot about running - my races, my training and my general struggles and successes with the sport that I've come to love. But an activity that I love just as much and spend just as much time practicing doesn't get mentioned nearly as often on the blog. I'm talking, of course, about yoga. 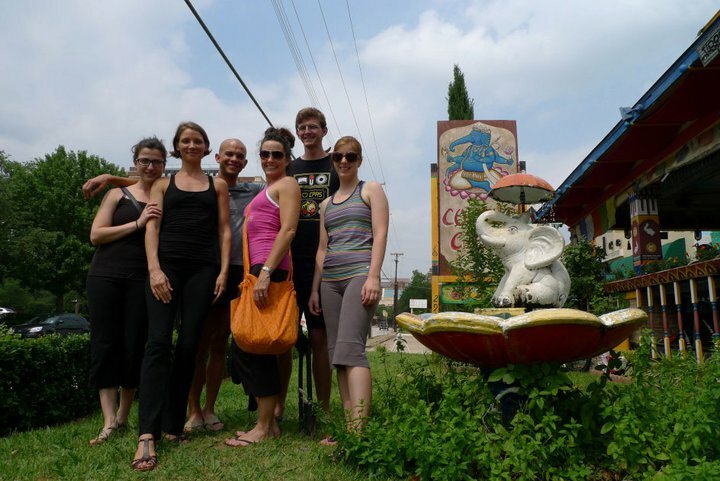 I practice an average of three times a week, mostly by attending classes at Morning Glory Yoga Studios, which is owned and operated by one of my closest Nacogdoches friends. I write a monthly newsletter for the studio and do other PR and promotional tasks (press releases and Facebook, mostly) in exchange for my membership. And I love it. It doesn't matter that I have the world's tightest hips, that I can't touch my toes until the end of class, that my mind never stops moving, not even in svasana. The thing about yoga is that it's always a practice - you're never finished. Today I'm working on handstand. But once I master that pose, there will be a new challenge waiting. This is just as true for the beginner attending their first yoga class and the guru in India who has been practicing for forty years. In yoga, we're all equals. Saturday: Amy picked me up at noon and we proceeded to collect the rest of our group, which included Eralda, Chip, Cyndra and Arrie. We then drove 3.5 hours until we arrived at our hotel in Dallas. There was time for one beer at the hotel bar and then we headed to the King Spa and Sauna to meet Ricky and his friend. The Spa was not a spa in the traditional sense. It's open 24-7 and features tons of different rooms that you could sit in - some were very hot and humid, some were cold, some featured aromas, some pumped up with oxygen. There was also food, chairs for reading or napping, and places to just hang out and enjoy the experience. And then there were the baths. As soon as we got there, the men and the ladies separated and we striped down to our birthday suits, then entered the baths. First we sat in the hot bath, which was 105 degrees. We alternated the hot bath with the cold bath, which was a terrible, terrible 60 degrees. I couldn't go in past my waist. When we were driving to the spa I got nervous about the whole naked thing, but once I got into the baths it seemed like the most normal, natural thing I could do. It helped that everyone else was naked and walking around like it was no big deal. Fake it until you make it, right? After the baths we were given uniforms to wear, which were the ugliest things in the world. Then we visited all the saunas (this part was co-ed). My favorite was a super hot hut (I guessed it was about 130 degrees). We sat in it for about eight minutes and I closed my eyes and enjoyed the sensation of sweat rolling down my body. Our awesome spa uniforms. Photo by Amy Sanford (as you can see). After the spa, we had dinner at the Spiral Diner which is one of my favorite restaurants in all the world - totally vegan, totally delicious. And then it was all I could do to keep my eyes open until I got back to my bed and fell asleep. Ashtanga yoga is a system of yoga transmitted to the modern world by Sri K. Pattabhi Jois (1915-2009). This method of yoga involves synchronizing the breath with a progressive series of postures — a process producing intense internal heat and a profuse, purifying sweat that detoxifies muscles and organs. The result is improved circulation, a light and strong body, and a calm mind. Practioners of Ashtanga cannot move on to the next series of poses until they master the first one. There are eight series in all, but most people practice the standing series (five each of Sun Salutations A and B) and the Primary Series. This wasn't my first Ashtanga class so I knew what to expect (you practice the same poses in the same order each time) and there is something about the disciplined approach to yoga that I appreciate. I don't know if I would want Ashtanga to be my main practice, but branching out and trying new yoga styles and instructors is definitely a learning experience. After class ended we took a break and then jumped right into the workshop part of the morning. Ricky basically broke down the primary sequence and we practiced each individual move again, and again, and again. 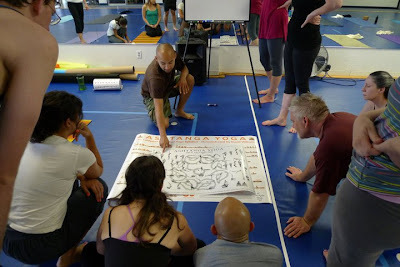 We got deeper into the poses and really got a chance to explore our bodies in them. This was even tougher than the actual class - so many chaturangas, so many chair poses! My shoulders felt like they were going to fall off and the next day, my abs were sore. But again - so educational and so worth it. Lunch at the Cosmic Cup! After our morning of yoga ended, we had lunch at the Cosmic Cup, a great vegetarian hippie restaurant in Dallas, and then drove back to Nacogdoches. 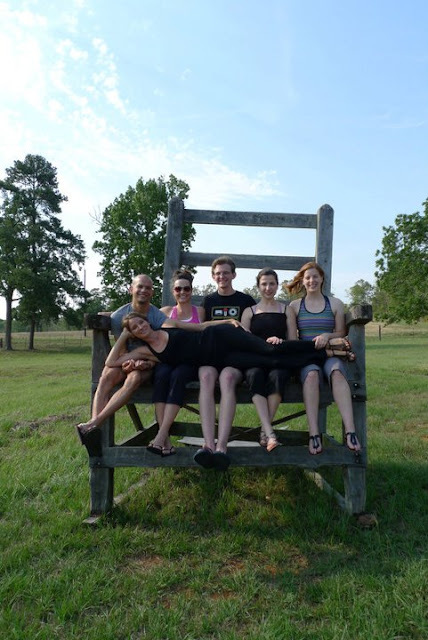 On the drive home, we passed an over sized chair in a field and stopped to take photos. Obviously. It was the perfect end to a great weekend.